Box Text: Experience the intensity of being the world's top secret agent. Equipped with a full arsenal of Q-Lab gadgets and weaponry, you must be suave and resourceful as you carry out action-packed missions based on the blockbuster movie. Are you cool under pressure? Cunning when necessary? Of course you are - you're Bond... James Bond. 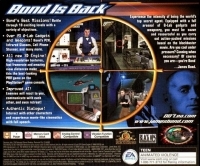 • Bond's Best Missions! Battle through 10 exciting levels with a variety of objectives. • Over 20 Q-Lab Gadgets and Weapons! Bond's P2K, infrared glasses, cell phone stunner, and many more. • All new 3D Engine! High-resolution textures, fast framerate and amazing view distances make this the best-looking POV game on PlayStation. • Improved AI! Enemies will react to you, communicate with each other, and even retreat! • Authentic Dialogue! Interact with other characters and experience movie-like cinematics with full speech. 04-17-2014 rberggren Box Text Experience the intensity of being the world's top secret agent. Equipped with a full arsenal of Q-Lab gadgets and weaponry, you must be suave and resourceful as you carry out action-packed missions based on the blockbuster movie. Are you cool under pressure? Cunning when necessary? Of course you are - you're Bond... James Bond. • Bond's Best Missions! Battle through 10 exciting levels with a variety of objectives. • Over 20 Q-Lab Gadgets and Weapons! Bond's P2K, infrared glasses, cell phone stunner, and many more. • All new 3D Engine! High-resolution textures, fast framerate and amazing view distances make this the best-looking POV game on PlayStation. • Improved AI! Enemies will react to you, communicate with each other, and even retreat! • Authentic Dialogue! Interact with other characters and experience movie-like cinematics with full speech. 04-16-2014 rberggren Box Text Experience the intensity of being the world's top secret agent. Equipped with a full arsenal of Q-Lab gadgets and weaponry, you must be suave and resourceful as you carry out action-packed missions based on the blockbuster movie. Are you cool under pressure? Cunning when necessary? Of course you are - you're Bond... James Bond. 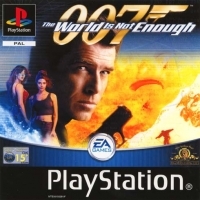 This is a list of VGCollect users who have 007: The World is Not Enough in their Collection. This is a list of VGCollect users who have 007: The World is Not Enough in their Sell List. 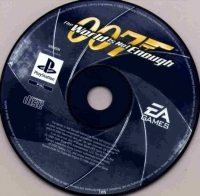 This is a list of VGCollect users who have 007: The World is Not Enough in their Wish List.